The Moreish Puff Candy Drops Grape & Strawberry e liquid lets you enjoy the sweet taste of Summer with its delicious Grape and Strawberry, candy drop combo that’ll sure make an impact on your e liquid repertoire. The Moreish Puff Candy Drops Lemon & Sour Apple e liquid is a tang tastic flavor filled with candy drops of sweet Lemon and sour sizzling apples to get your taste buds dancing. 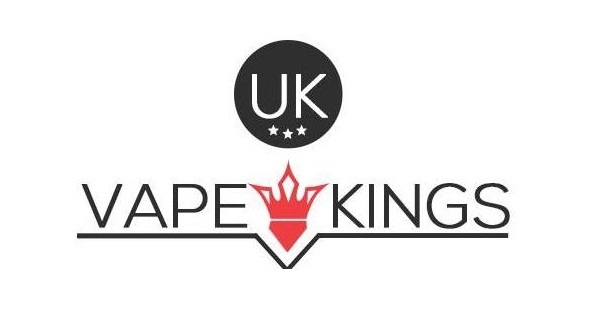 Grab this unmissable 100ml nicotine free e liquid. The Moreish Puff Candy Drops Lemonade & Cherry e liquid lets you enjoy the sweet taste of Summer with its delicious Lemonade & Cherry, candy drop combo that’ll make your taste buds burst with excitement. The Moreish Puff Candy Drops Rainbow e liquid is a sweet mix of an array of candy drop flavors that, together, form an outstanding vaping e liquid. Nobody has found the end of the rainbow till now, with this unmissable flavor that will take your taste buds for a ride. The Moreish Puff Candy Drops Watermelon & Cherry e liquid lets you enjoy the sweet taste of summer with its delicious Watermelon and Cherry, candy drop combo that’ll make your taste buds burst with excitement. Moreish Puff Chilled Blue Raspberry 0mg 100ml Shortfill E-liquid is a perfect blue raspberry vape with a cool and crisp bite! 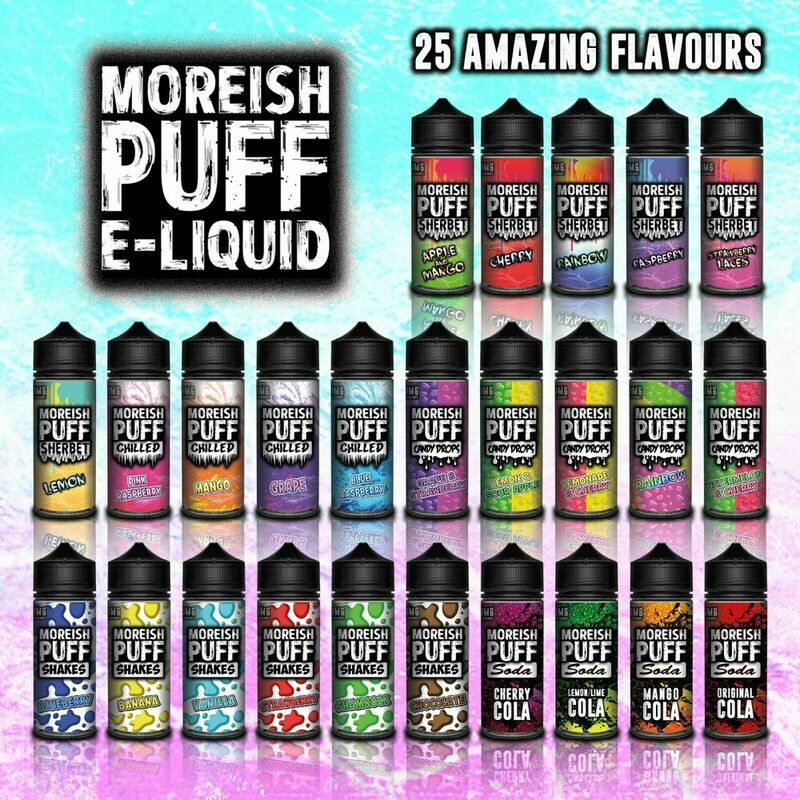 Moreish Puff Chilled Blue Raspberry is a 100ml short fill and a nicotine free e liquid. Moreish Puff Chilled Grape 0mg 100ml Shortfill E-liquid is a sweet and juicy grape flavor with a wickedly icy aftertaste! Moreish Puff Chilled Grape is a 100ml short fill and a nicotine free e liquid. Moreish Puff Chilled Pink Raspberry 0mg 100ml Shortfill E liquid features freshly-picked pink raspberries with a frosty finish! Moreish Puff Chilled Pink Raspberry is a 100ml short fill and a nicotine free e liquid. Moreish Puff Shakes Banana 0mg 100ml Shortfill E liquid is full of tropical flavor with a ripe banana taste and a velvety finish that’ll make you go Bananas. Moreish Puff Shakes Banana is a 100ml short fill and a nicotine free e liquid. Moreish Puff Shakes Blueberry 0mg 100ml Shortfill E liquid is made with only the juiciest of blueberries leaving a sweet, tangy taste for a mouth watering vape experience. Moreish Puff Shakes Blueberry is a 100ml short fill and a nicotine free e liquid. Moreish Puff Shakes Chocolate 0mg 100ml Shortfill E liquid is the perfect calorie-free treat for all you chocoholics! Moreish Puff Shakes Chocolate is a 100ml short fill and a nicotine free e liquid. Moreish Puff Shakes Shamrock 0mg 100ml Shortfill E liquid is a mint shamrock shake that’ll transport you to the emerald isle and leave your taste-buds feeling brand new. Moreish Puff Shakes Shamrock is a 100ml short fill and a nicotine free e liquid. Moreish Puff Shakes Strawberry 0mg 100ml Shortfill E liquid a firm favorite, our sumptuous blend of freshly picked strawberries in a creamy shake will bring everyone to the yard! 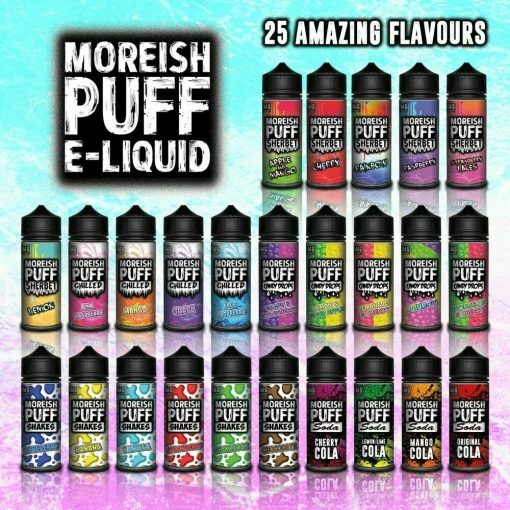 Moreish Puff Shakes Strawberry is a 100ml short fill and a nicotine free e liquid. Moreish Puff Shakes Vanilla 0mg 100ml Shortfill E liquid is a deliciously smooth vanilla shake that’ll leave you thirsty for more. 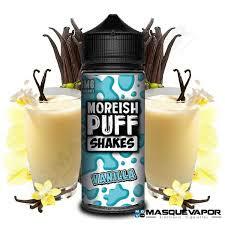 Moreish Puff Shakes Vanilla is a 100ml short fill and a nicotine free e liquid. Moreish Puff Cherry e liquid is a taste-bud tantalising flavor featuring fizzy cherry sherbet! An awesome, juicy vape with an exhale that lingers on the tongue! Moreish Puff Sherbet Lemon E liquid delivers a fine tuned taste with just the right amount of tangy sherbet without being overly tart that the light lemon flavor is hidden behind the sweetness. 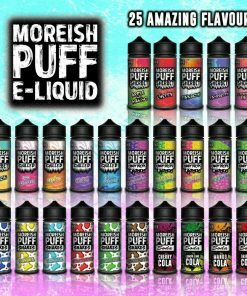 Moreish Puff Rainbow e liquid let’s you experience the whole spectrum of flavors with this heavenly rainbow sherbet! Indulge in this heavenly concoction featuring an array of sweet candies. Moreish Puff Raspberry e liquid is a refreshing concoction featuring the ripest of raspberries alongside a sweet sherbet exhale that dances around your taste buds and nicely coats your mouth with Raspberries. Moreish Puff Strawberry Laces e liquid is a sensational strawberry sherbet flavor that tastes just like the old school sweet! A spectacular mouth watering liquid that’ll quickly become your daily vape. The Moreish Puff Soda Cherry Cola e liquid is a sweet combo of two delicious flavors. Together, Cherry and Cola form an iconic duo and a great fizzy flavor complimented with a tangy punch line making this a familiar and unmissable vaping experience. Get your 100ml short fill of nicotine free 0mg Cherry Cola e liquid while you can. Moreish Puff Soda Mango Cola 0mg 100ml Shortfill E liquid combines the classic cola flavor with the most exotic mangos for all-day vape! Moreish Puff Soda Mango Cola is a 100ml short fill and a nicotine free e liquid. The Moreish Puff Soda Original Cola e liquid, characterized with the vintage Cola flavor. This e liquid will throw you back on a trip down memory lane. So sit back, relax, and inhale this sweet e liquid refresher of your favorite soda.